Aleksandra's Note: It is a bit ironic that on the 65th anniversary of the beginning of the Trial of General Mihailovich on June 10, 1946, news reports are being issued once again in Serbia about the location of the remains of Draza Mihailovich that have, to date, never been found. The communist trial that resulted in the foregone conclusion of a "conviction" and the immediate execution of the Serbian freedom fighter was a sham. Draza Mihailovich died at the age of 53 in July of 1946. His prosecutor, top ranking communist official Milos Minic, who, among other things, was Mayor of Belgrade from 1955 to 1957 and Yugoslavia's Minister for Foreign Affairs from December 16, 1972 to May 17, 1978. lived comfortably to the ripe old age of 89 in 2003. My guess is that, unlike Mihailovich, he was given a proper funeral. under dictator Josip Broz Tito. Died on September 5, 2003 in Belgrade, Serbia. court secretary is at far right. 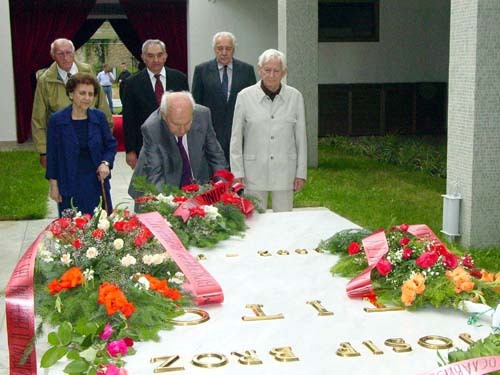 laying flowers at the grave of Tito. and AVNOJ member Milos Minic." "THIS RECORD OF STENOGRAPHIC MINUTES TAKEN AT THE TRIAL OF THE TRAITORS AND WAR CRIMINALS LED BY DRAGOLJUB-DRAZA MIHAILOVIC, CONTAINS ONLY THOSE PARTS OF THE INDICTMENT, THE EXAMINATION, EVIDENCE AND OTHER MATTER WHICH RELATE DIRECTLY TO THE TRAITOR MIHAILOVIC." On June 10, 1946, before the Military Council of the Supreme Court of the Federative People's Republic of Yugoslavia began the trial of 24 traitors and war criminals, including the leading criminal Dragoljub-Draza Mihailovic. The trial took place in the Summer Hall of the Infantry Training School at Topcider, and lasted till July 15, when sentence was passed. It was attended everyi day by hundreds of men and women from Belgrade and other parts of the country. A total of about 30,000 persons attended this trial. The accused were tried before the Military Council of the Supreme Court of the Federative People's Republic of Yugoslavia, composed of the President, Colonel Mihailo Dordevic and the members of the Council, Lieutenant-Colonel Milija Lakovic and Lieutenant Mihailo Jankovic; the secretary was Lieutenant Todor Popadic and the assistant judges, Major Nikola Stankovic and Major Radomir Ilic. The prosecution was represented by the Deputy Military Prosecutor of the Yugoslav Army, Colonel Milos Minic, with his assistant Captain Milos Jovanovic. The accused were Dragoljub-Draza Mihailovic, Dr. Stevan Moljevic, Dr. Mladen Zujovic, Dr. Zivko Topalovic, Duro Vilovic, Radoslav-Rade Radic, Slavoljub Vranjesevic, Milos Glisic, Slobodan Jovanovic, Bozidar Puric, Dr. Momcilo Nincic, Petar Zivkovic, Radoje Knezevic, Dr. Milan Gavrilovit, Zivan Knezevic, Konstantin Fotic, Dragomir-Dragi Jovanovic, Tanasije-Tasa Dinic, Velibor Jonic, Dura Dokic, Kosta Musicki, Bosko Pavlovic, Dr. Lazar-Laza Markovic and Dr. Kosta Kumanudi. The following were tried in their absence: Slobodan Jovanovic and Bozidar Puric, premiers of the emigrant government, Petar Zivkovic, Dr. Momcilo Nincic and Dr. Milan Gavrilovic, ministers of the emigrant government, Radoje Knezevic, minister of the court in emigration, Konstantin Fotic, ambassador of the emigrant government to the USA, Major Zivan Knezevic, director of the military chancellery of the presidium of the emigrant government, Dr. Zivko Topalovic and Dr. Mladen Zujovic, political leaders of the Ravna Cora Chetnik organization, who had fled abroad. All the accused were represented by counsel, as follows: Dragoljub-Draza Mihailovic, by the barristers Nikola Donovic and Dragic Joksimovic; Buro Vilovic, by Dr. Milan Omcikus, barrister; Dragoljub-Dragi Jovanovic, by Slavko Dukanac, barrister; Tanasije Dinic, by Dr. Bogoljub Jovanovic, barrister; Velibor Jonic, by Milan Zivadinovic, barrister; Duro Dokic, by Dragoljub Joksimovic, barrister; Dr. Lazar Markovic, by Aleksandar Nikolic, barrister; Dr. Kosta Kumanudi, by Dr. Friedrich Pops, barrister, all of which were chosen by the accused themselves. The other accused were defended by counsel chosen by the Court: Radoslav Radic, by Lazar Vucetic, barrister; Slavoljub Vranjesevic and Milos Glisic, by Blazo Radovic, barrister; Kosta Musicki, by Dorde Ciric, barrister; Bosko Pavlovic, Radoje Knezevic, and Dr. Milan Cavrilovic by Slobodan Subotic, barrister; Dr. Mladen Zujovic and Dr. Zivko Topalovic, by Nikola Radovanovic, barrister; Slobodan Jovanovic, by Milos Terzic, barrister; Bozidar Puric and Petar Zivkovic, by Pavle Miljakovic, barrister; Dr. Momcilo Nincic, by David Alkalaj, barrister; and Zivan Knezevic and Konstantin Fotic, by Dragutin Tasic, barrister. The trial of the traitors and war criminals in Topcider was attended by more then 100 journalists of whom about 60 were from abroad, representatives of all big world papers and agencies. Special correspondents were sent by the agencies TASS, CTK, PAP, Reuters, Associated Press, Agence France Presse, United Press, Overseas News Agency, International News Service, the Jewish News Agency, Tele-Press, the Albanian Telegraph Agency and the newspapers: Pravda, Izvestia, London Times, Daily Worker, New York Times, New York Herald Tribune, News Chronicle, Daily Express and others. In order to facilitate speedy communication for the foreign journalists, who had come from the USSR, Bulgaria, Poland, Czechoslovakia, the United States of America, Great Britain, France, China, Hungary, Roumania, Denmark and other countries, a special office for telegraph and telephone service was established at Topcider. The entire proceedings of the trial were translated into Russian, French and English, so that the foreign correspondents were enabled to follow directly every word of the Court and the accused. In this way the correspondents were able to send to their agencies and editors their reports on statements and facts which had been heard in Court a few minutes previously. Special correspondents of the papers of all the People's Republics of Yugoslavia were also present. 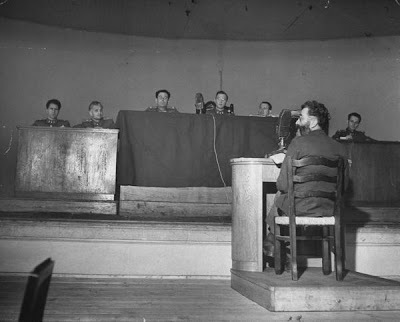 The Belgrade Radio Station transmitted the whole course of the proceedings, so that the entire country and the world public could listen to every word pronounced at this stupendous trial. Many hundreds of thousands of persons throughout Yugoslavia listened with the greatest attention to the transmission of the Topcider trial, in workshops, institutions, houses and squares, in all towns and villages.